Beers Made by Walking (BMBW) is a program that invites brewers to go on nature hikes and make beer inspired by plants found on the trail. Today BMBW and Sutro Stewards announce the release of more than 15 beers inspired by the trails of Mount Sutro and other Bay Area landscapes. The tapping will take place at Standard Deviant Brewing in San Francisco, on Sunday, November 13 from 2:00-5:30pm. 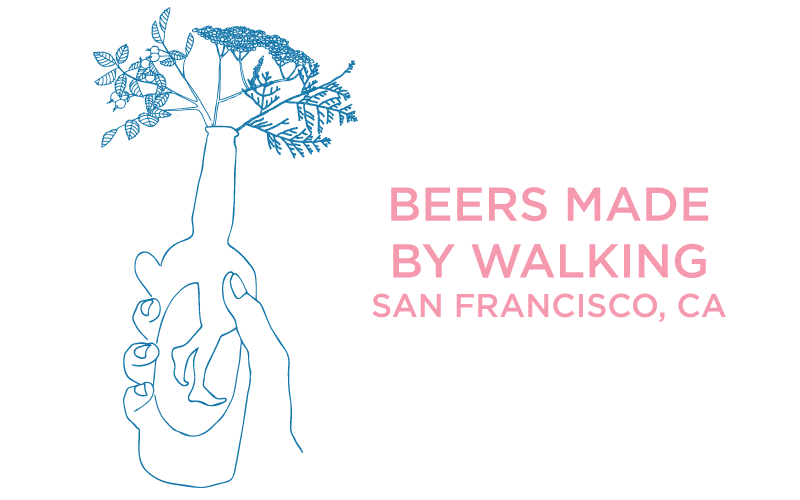 The beers at the event come directly from a collaboration with Sutro Stewards, an organization that brought San Francisco residents a series of public hikes attended by local brewers this summer. Proceeds from the event will benefit Sutro Stewards. Tickets are $30 and include a commemorative glass and samples for 10 place-based beers. Last year the event sold out so grab your tickets now. This ale is made with oak-smoked wheat malt and acorns brought to life by American hefeweizen yeast, then is infused with spice notes of cluster hops. Paint your gustatory walls with hints of smoky, spicy fruit reminiscent of a Polish Grätzer, and celebrate our restraint in not making up the word “smoaked” to describe it. Rye Pilsner with smoked fennel, hachiya persimmons and peppercorns. The fennel and persimmon were grown on the Mill Valley market farm at Green Gulch. Barrel aged Belgian Imperial Stout with wild blackberries. Golden bitter brewed with Maris Otter malt and Minstral, Jarrylo and Hallertau Blanc hops as well as botanicals from Golden Rabbit Ranch in western Sonoma: Douglas fir tips, madrone berries and bark and California bay laurel. Pacific Brewing Laboratory & Cody Badger "Badger Brewing"
Smoked Porter with yarrow, mugwort, sagebrush, dry hopped with hummingbird sage. Manzanita and oak wood used for smoking. Kolsch made with yarrow and mugwort. California rose tip & locally grown nectarine Brett beer. Manzanita sour with sun dried, tree-ripened manzanita berries. Brewed with organic Pale malt to achieve the color of the Golden State and hopped with organic Magnum, Bravo, Centennial and Chinook hops. The hop flavors and bitterness are complemented by mugwort and the hop aromas are complemented by yarrow and sage. Envision walking along the coast of the Marin Headlands after a morning fog. Wheat beer with two types of wheat, a carefully selected Belgian yeast and infused with locally foraged sagebrush. Brewed with a trifecta of native flora consisting of nasturtiums, redwood tips and yampah seeds, this rye saison combines a slight spicy tang with a licorice-like sweetness and an orange rind bitterness.